A recent workshop held on the doorstep of policymakers in the United States drew speakers from academic and activist circles to examine the mechanisms in US law which could help lead to lower prescription drug prices. The workshop, entitled, “U.S. 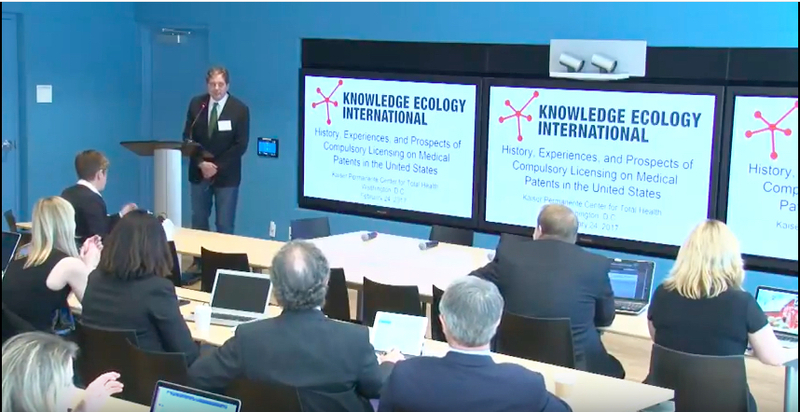 History, Experiences, and Prospects of Compulsory Licensing of Medical Patents,” was organised by Knowledge Ecology International and held in Washington, DC on 24 February. American patients pay the highest prices in the world for prescription drugs, often much more for the same drugs than patients in other high income areas like the European Union, numerous panellists argued. In the United States, the prices of medicines are set by drug manufacturers, and not regulated or negotiated by a government agency as they are in many other countries. The absence of generic competition for patented drugs means that there are few barriers for companies to charge high prices at will. Panellists referenced the high price of the hepatitis medicine Sovaldi, the $89,000 per year price tag for deflazacort, a steroid treatment for muscular dystrophy, and the recent price hikes on the Epipen, of which the delivery device is patented though not the medication within it. As drug prices are not directly regulated, the workshop focused on existing United States law which allows for mechanisms which could be used to lower drug prices. In one panel, Prof. Amy Kapczynski of Yale Law School explained that one section of US legal code, USC 1498, allows for the government to pursue a compulsory licence for patented goods, including medicines. As traditionally a government cannot be sued because it has sovereign immunity, Kapczynski explained, the law is essentially a waiver of this immunity, in which the government will accept liability. Kapczynski elaborated that the law does not permit for an injunction, but does require that the patent holder be paid a reasonable royalty. There are restrictions to the use of a compulsory licence, as the law only covers use for the US federal government, and with the authorisation and consent of the federal government. While the law would also apply to government contractors when they are cloaked in sovereign immunity, it would not automatically apply to a US state or privately run program, she said. Challenges may also come in determining what “reasonable” compensation may amount to. As Kapczynski explained, the profits of the company creating the generic version of the drug could be used as a baseline, with additional funds being sent to the patent holder to compensate for the research and development spent on the drug. Before issuing a compulsory licence, Kapczynski said, agencies want to know what their liability will be, and confusion about reasonable royalty amounts prevents this. The panellists explained that while the legal statute has been used often by some government agencies, notably the Department of Defense, it has not been used to procure medicines in recent years. This law is not the only legal mechanism which the US government could use to create less expensive medicines. Panellists at the workshop also discussed “march-in rights” permitted under the Bayh-Dole Act. The law created by this act permits the licensing to private firms of technologies which were created using public funds. The private firm could then patent the invention it develops using this technology. As many innovations in medicine have been enabled by government funds in the past 40 years, the potentially patented items are vast. Bayh-Dole allows the government to retain “march-in rights”, through which a government could require the patent holder to grant a licence to other contractors, and the government could also grant this licence itself. According to Aaron Kesselheim, associate professor of medicine at Harvard University Medical School, there are four conditions, and if any one is met, a federal agency can institute march-in rights. These conditions, per Kesselheim, are: the licensee has not taken effective steps to achieve practical application of the invention; health and safety needs exist that are not reasonably satisfied by the licensee; the government-funded invention is required for public use specified by federal regulations and such requirement is not reasonably satisfied by the licensee; a sub-licensee violated its agreement to substantially manufacture the product in the United States. Kesselheim also said that some people consider march-in rights to be working as a “shadow effect”, as products are being developed and not “left on the shelf”. Medicines are being created, after all, even though they are sometimes expensive. Devine referenced numerous polls which show widespread support throughout the United States for measures that would lower the prices of drugs, including shortening patent terms and allowing for Medicare to negotiate drug prices. "Workshop: How To Tackle The High Cost Of Prescription Drugs In The US" by Intellectual Property Watch is licensed under a Creative Commons Attribution-NonCommercial-ShareAlike 4.0 International License.